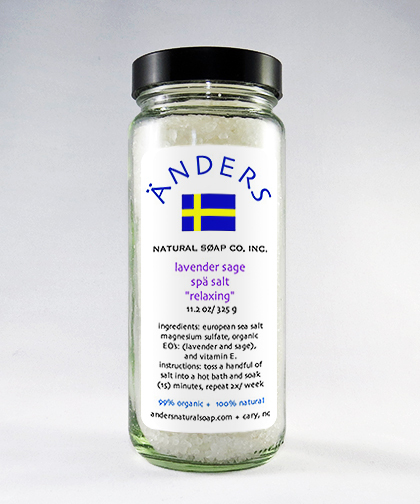 Our Lavender Sage Spa Salt is a very “calming and relaxing” blend. Many people associate Lavender essential oil with restful calm. We formulated all of our “Spä Salts” with a base of European spa salt (Mediterranean sea salt) and magnesium sulfate (Epsom salt). This blend is very high in minerals that aid in detoxing. We then added therapeutic grade organic essential oils to the mix along with vitamin E making our bath salts 100% natural. The European spa salts blended with magnesium sulfate are high in mineral content making them great for muscular aches and pains. We previously used Dead Sea salts in our Spä Salts, but due to sustainability issues of the Dead Sea, we opted to discontinue the use of the Dead Sea salts. The water level of the Dead Sea is declining at a rate of one meter per year, so we made a conscience decision not to be a part of its demise. We will continue to use Dead Sea mud in our facial products, as the mud is reported to have no effect on the decline of the Dead Sea. We use coarse salts which are packaged in a clear glass jar with a black phenolic cap and a rectangular label attached. European Spa Bath Salt, also known as: Mediterranean Sea bath salt. It is a perfect sea salt to blend into a bath salt. It is ideal for blending with essential oils for scrubs and body treatments. European spa salts are full of minerals and especially beneficial when blended with a small amount of magnesium sulfate. Epsom salt is a pure mineral compound of magnesium sulfate in crystal form, so it looks an awful lot like salt. But it has no sodium chloride, which is what salt is. Even though it isn&apos;t salt, we don&apos;t deny the many time-proven benefits of Epsom salt. A lot of people are magnesium deficient, which can be to blame for a number of maladies including heart disease, stroke, osteoporosis, arthritis and joint pain, digestive problems, and chronic fatigue. The very best way to benefit from this mineral is in the form of a bath salt. A dose of Epsom in your bath salts will power it up, and make it extra therapeutic. White Sage is known as sacred sage. The leaves and flowers of sage are antibacterial, antifungal, antimicrobial, extremely antioxidant, antiseptic, antiviral, astringent and healing. White Sage essential oil is described as a refreshing camphoraceous top-middle note with a spicy warm undertone. Its properties for mind include: antidepressant, calming, energizing, grounding and uplifting for mental strain and fatigue. Toss a handful of salts into a hot bath and soak for 15-20 minutes. Repeat this process 2X per week.